Breasts are made up of ducts, milk glands, and fatty and fibrous tissues. Fibrocystic disease is when there are fluid-filled lumps (cysts) of duct tissue. These lumps are surrounded by a scar-like capsule of tissue in the breasts. The glands in the breasts change throughout the monthly cycle. They get bigger to get ready for a pregnancy. They shrink if one does not happen. 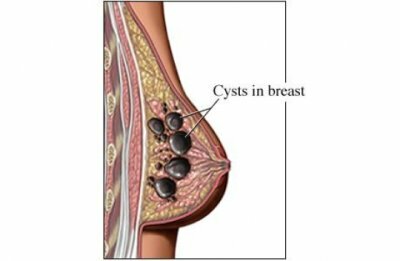 This cycling causes cysts and fibrous tissue to build up. All women will have some form of this condition during their reproductive years. Most women will not seek medical care. All women between puberty and menopause are at risk for this disease. These harmless lumps can sometimes cause pain that happens late in each menstrual cycle. Pictures may be taken of your breasts. This can be done with a mammogram . It can be hard to tell the difference between this disease and breast cancer . No treatment is needed unless you have pain. Dietary changes, such as not drinking caffeine products. Needle aspiration—If the fluid is removed, the cyst usually goes away. After numbing the area, a small needle is inserted into the cyst. This is to draw fluid out. A fine needle biopsy is like an aspiration. The only difference is that a tiny piece of tissue is also drawn out of the lump. An excisional biopsy removes the entire lump through an incision. This can be done with local anesthesia if the lump is small. Fibrocystic disease can’t be prevented. Miltenburg DM, Speights VO Jr. Benign breast disease. Obstet Gynecol Clin North Am. 2008;35(2):285-300. Phyllodes tumor of breast. EBSCO DynaMed Plus website. Available at: http://www.dynamed.com/topics/dmp~AN~T113915/Phyllodes-tumor-of-breast . Updated June 23, 2014. Accessed July 24, 2018.